We have 7 major Chakras that support us. Each Chakra vibrates to a high frequency and is a different color relating to specific areas of our lives as well as specific body parts. Often when we are in transition, stress occurs, and our Chakras carry a lot of that stress for us and instead of vibrating and supporting us it becomes ‘stuck’ and we don’t feel that we are our ‘usual self’. Likewise, when a body part is experiencing dis-ease the corresponding Chakra holds the memory and we can feel (as some clients describe it) ‘not right’. Feeling scattered, unable to concentrate, and ungrounded is another sign our Chakras need clearing and balancing. e.g. The Throat Chakra is a very powerful Chakra that actually tells us when it is out of alignment. We find ourselves constantly having to clear our throats or cough when in fact we don’t have a cough or cold. 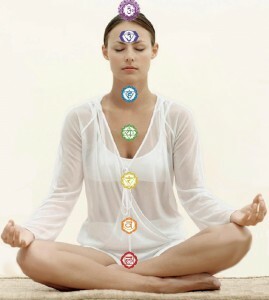 It carries all the unspoken emotions for our body which can be resolved by having a Chakra Clearing/Balancing. To learn more or book a Chakra Clearing/Balancing session call Sharon at 905-392-1685.